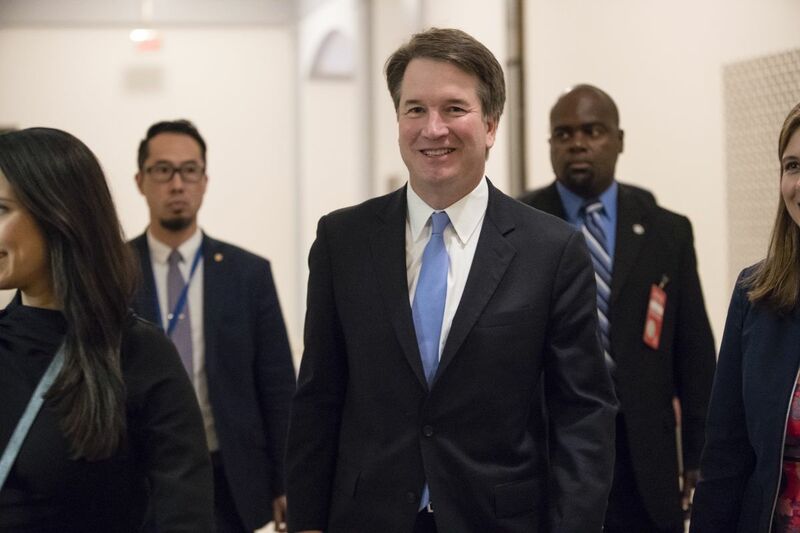 WASHINGTON — A new poll by the American Civil Liberties Union found Alaskans were divided on whether nominee Judge Brett Kavanaugh is a good candidate for the Supreme Court, though a large majority wants to see a justice that is independent from the White House. A left-wing polling firm, Harstad Strategic Research Inc., completed the survey on behalf of the ACLU. The organization released the poll in a press conference with Protect Our Care Alaska, an organization that favors the Affordable Care Act and has been active in opposing Kavanaugh's nomination. The poll was one that both aimed to gather opinions and shape them by offering information on some of Kavanaugh's prior opinions. At the start of the poll, 44 percent of those surveyed approved of his nomination, and 42 percent opposed him. After new information offered by the poll-takers, 39 percent favored his nomination, and 54 percent were opposed. Harstad Strategic Research Inc. polled 602 Alaskans who were considered likely voters, using live interviewers calling landlines and cellphones from Aug. 14 to Aug. 20. Of those polled, 15 percent identified as Democrats, 21 percent identified as Republicans and 60 percent identified as Independents. Voters were split on when the Senate should vote on confirming Kavanaugh: 45 percent said before the November midterm elections; 46 percent said after the midterm elections. Those polled wanted the justice to be an independent part of the judiciary: 63 percent disagreed with the idea (previously espoused by Kavanaugh) that the president should not be subject to civil lawsuits or criminal investigations or indictments while in office. Even more — 73 percent — said that the justice should be independent of President Donald Trump's influence and committed to holding the president accountable. The majority of those polled (62 percent) thought Alaska's senators should consider how Kavanaugh would rule on social and political issues, and that he should not overturn Roe. v. Wade (65 percent), the landmark abortion rights case. But Alaskans polled were less certain about whether the confirmation vote would change how they view Alaska Sen. Lisa Murkowski. More people (43 percent) said they would view her more favorably if she voted against Kavanaugh's confirmation than those who would view her less favorably for voting against him (27 percent). Murkowski has been under increasing pressure over her as-yet-undetermined vote on the nominee. Republicans hold a slim 50-vote majority in the Senate. Alaska Sen. Dan Sullivan, also a Republican, announced early in the process that he plans to vote to confirm Kavanaugh.